Do you want a long, dense and shiny hair? This demand is very common in every women list. It seems incredible to attain this beauty due to daily contact to sun, dust, dirt, and pollution present in the environment. The beauty products offered in the market comprise for us. Therefore, to solve this problem, today in this article we are highlighting on the beauty tips to keep your hair strong and healthy. With the glorious and perfect hair you will regain your confidence. Every women or girl wants picture perfect hair but very less people have perfect hair? Every individual facing a different problem related to the hair. In most of the cases the hair is very curly and with some volume is missing and also for some unidentified reason the hair ends is divided again. All of you devote their valuable time, energy and lots of time on hair maintenance. Hair is the extension of the skin that means the outer covering of the skin. The hair cells are packed of mostly proteins as well as these cells halts lasts for 3-5 years till it grows out or falls out. If you are women then you have to pay more attention on your hairs. Now, here we are giving you some beneficial and fabulous beauty tips which are very helpful to maintain the hair’s shine and healthiness. At least 12 to 14 glasses of water daily is recommended for the accumulation of the body toxins to get flushed off easily. You can also add coconut water in your daily routine. This is not only helpful for your skin as well as for healthy hair. Yes! The healthy diet plays a very essential role in the overall health of our hairs similar to the skin. For getting healthy hair you have to take care of yourself from externally as well as internally. Here we are giving some advices to your diet according to the hair type which will very beneficial to give some shining and also some bounce to your hair. Oily hairs: You can add some super foods in your diet such as raw vegetables, nuts, brown rice, pulses, vitamin E rich foods and bananas. Normal Hair: If you have normal hair then you can include protein rich food like sprouts, Fish, dals, and chicken etc. Dry hair: For getting rid from the dry hairs you should involve salads, fresh fruits, green leafy vegetables as well as yogurt. Now, some people think that by chemical treatment we can give a good look to our hairs but actually it gives a long-lasting damage to your hairs. Therefore, stay away from the chemical treatment of the hairs. If it is not possible for you then use only gels and sprays which are very useful to style your hairs. The gels as well as sprays are only gives temporary damage to your hairs for irregular users. One thing is very important that after using all this give oil the hairs accurately. It is very necessary to give conditioning your scalp as well as your hairs for about thrice a week. When you wash your hairs then there is a need of condition your hair as well as deep conditioning treatment from inner side. Hence we are giving some method to make homemade conditioner for your hairs. For getting shiny as well as soft hairs use mayonnaise because this is inordinate source of protein. First of all rub it on your hair around your hairs, leave this for about an hour to wash out. Condensed milk is also a great protein amount therefore apply this as an ingredient as your conditioner. It is also very important to note that the protein offers an extra luster. Add 2 tsp olive oil with the 2 tsp aloe Vera gel also adds 6 droplets of sandalwood oils as well as rosemary oil. Because rosemary is responsible for softness, aloe Vera hydrates and olive oil acts s emollient. The olive oil and honey is best for the treatment of damaged hairs. The sun rays are very harmful for hairs and it greatly spoils the hairs. Olive oil as well as honey both contains not only conditioning properties but also anti- bacterial properties. Take 2 teaspoon of olive oil and half cup honey and massage on a clean dry hair and leave this for about 20 minutes. Wash with warm water. You can also try honey with aloe Vera leaves. First of all take a fresh gel from the aloe Vera and add this into honey. Apply this paste on the scalp as well as on all the hairs. After 20 minutes rinse this with warm water. This is a homemade hair pack which is very effective for a smooth and shiny hair. Fenugreek seeds, honey and curd are used for making this pack. You will get a wonderful hair by using this pack. Therefore try this homemade pack at least once a week to get shiny hair. First of all soak the 50 grams of fenugreek seed overnight in the water. Next day make a paste by grinding the seeds with a slight amount of water. After that you have to mix about 4 table spoon of homemade curd, one teaspoon of olive oil, and honey in the fenugreek paste to make this paste smooth. Apply the pack kindly on all the hairs around your head and also your scalp is covered by this Pack. Leave this for about 45 minutes and then rinse your hairs with mild shampoo and wash with the water. As we all know the egg is used for the conditioning of the hairs. The egg gives the wonderful effect on the hairs. Because the egg is composed of proteins and fats which importantly functions as the moisturizer. The egg white is very helpful in the removal of uninvited oils. One thing is also remember rinse the hairs with only lukewarm water. It is also advised the use of egg according to types of hair. If you want to maintain your hairs healthy then it is very important to keep the hairs clean. The shampoo we use is responsible for cleaning, but ever you think that your shampoo is right for your hairs or not? There are infinite choices are present in the market. So, always choose a right product which is useful for your hairs. The shampoo just helps to clean your scalp and not more than that. Therefore only use a small amount or a drop of shampoo similar to a size of coin. Mostly, severe shampoos can really lead to more oil since your scalp efforts to repair again.Some important tips related to shampoo are given below which will helps the hair to become strong. For dry hair only select the shampoo that does not band your hairs of its regular oils. To increase the protein level in your hair makes ‘shampoo omelet’. For this you have to mix one egg into a slight amount of shampoo. Smear this mixture on your hairs. Stay for only for 5 minutes and then wash with water well. The shampoo which is responsible for preventing the movement of your oily scalp is suitable for oily hairs. Only use a mild shampoo for oily hair. Brown Hair: Blend henna and Indigo. Let it to sit overnight. Also add Indigo into warm water and allow it for about 15 minutes. Now mix this to make a paste and apply on your hairs all around your head. Then leave it for about for an hour by covering with a shower cap. After that wash with a good shampoo. Black hair: Similar to above mentioned, mix indigo into the warm water and allow this mixture for settled for about 15 minutes. Put henna paste on your hairs for near about 25 minutes and then rinse off. Add a little amount of salt in this Indigo mixture and then smear to your hair. Stay for 2 hours covering by a shower cap. And lastly wash off with the water. The plant oil or botanic oil is frequently offered at health food stores. The botanic oil such as sweet almond oils, olive, and jojoba oil is a delightful medicine for hair. The coconut oil plays a great work for the heavy as well as thick hairs. If your hair gets dull then you have to use a small amount of these plant oils till your hair is carefully covered. Cover your head with a warm towel for near about half an hour then wash and shampoo the hair as hour, then rinse and shampoo in a normal way. Also you can mix a few droplets of sandalwood oil in jojoba oil or olive oil. Then rub the mixture and apply with your fingers into scalp and also to the ends of the hairs it is very beneficial for controlling the condition of brittle, difficult hair. The avocado is highly rich in fatty acids, minerals as well as in vitamins which is responsible to give luster to your hairs. Crush a ripe avocado and mix with one egg, and then smear to wet hair. , allow it for about 20 minutes, and then wash several times. Repeat this for about once a week for spoiled hair as well as once a month for strong hair. 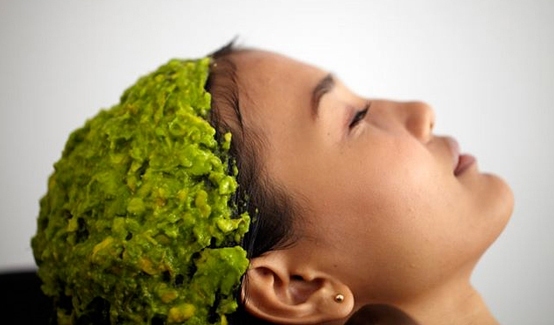 Apply a ripe avocado on the hair and after 10 minutes wash it off. This is very essential for the fizzy hairs to become soft. Tip: In summer there is requirement to wash your hair every three days. Therefore the dust and grime is splashed away. So these are the beauty tips for hair. I hope you appreciated this article and find this informative as well as beneficial for you! So try this and give a fabulous and wonderful look to your hair.